New aerial video of Bermuda shows off a new visitor experience now available on island, thanks in part to the Bermuda Tourism Authority’s [BTA] clarion call for home-grown ideas, which has paved the way for tours of the island in a single-engine Cessna 172 airplane. 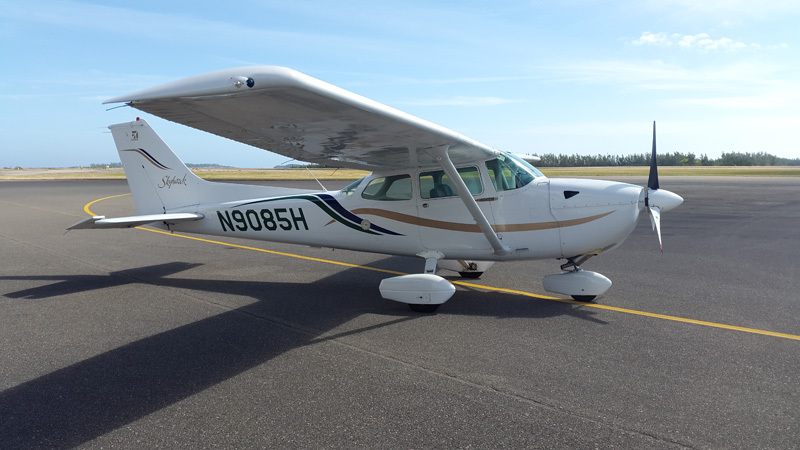 “The Product and Experiences division of the BTA approved a tourism experiences application for Blue Sky Flights to help the new venture literally get off the ground, offering aerial tours of the island in a single-engine Cessna 172. Blue Sky Flights is now up and running, providing visitors the opportunity to see sensational views of the entire country from above,” the BTA said. “The BTA is very excited to see this new visitor offering added to the Bermuda tourism product,” said Pat Phillip-Fairn, chief product and experiences development officer. “The new video certainly proves Bermuda is stunningly beautiful from the air and now we have an experience that opens the sky to our visitors. John Tomlinson, owner of Blue Sky Flights, said: “Every Blue Sky flight is fascinating and every flight uncovers a new hidden secret. In many ways we offer an aerial treasure hunt – part thrilling adventure, part breath taking beauty. Blue Sky Flights allows up to three passengers on board [or a 350 pound weight limit]. The rate is $400 per hour and tours can be catered to the customer’s preferences. For example an aerial tour of the island’s historic forts, world class golf courses or pink sand beaches can be customised. Flights built around full moons, romantic sunsets and America’s Cup racing are expected to be popular as well. Island Tour Centre is a booking agent for Blue Sky Flights and reservations can also be made directly through Longtail Aviation. Blue Sky Flights was one of 15 new experiences approved in the 2014 Tourism Experiences Investment Process. Forty applications were approved overall. Since the BTA began its search for new home-grown ideas, $1.7 million has been allocated to entrepreneurs who are focused on helping to improve the local tourism industry. I like how the Friends and Family deals are coming together, nice concept but I’ll wait until seat sales come out and fly to the U.S. for that price. It’s $400 per hour and can hold up to 3 people OR 350 lbs. So, split that cost between 3 people.. I would love to see you get 3 people to the US for that price. Blue Sky, the best of luck in your venture – this is pretty cool! Its a million times cheaper to just buy a drone, no need to rent an airplane. Where can you buy a drone for 0.0004 of a dollar? A drone can’t travel the whole island, it can only go in your control range. How many folks been in a Cestner before? Honestly I like it, I’m going to book a trip. Ok well…maybe not a million but you get what i’m sayin…Compleatly agree about the fun part. I fly on the reg for fun, its wicked, just really really expensive.You can get cheap drones for $500 and they have over a mile range. Point me to a drone-purchase for 4-ten thousanths of a cent. I’ll take two! 350lbs max. So me and de wife have to take separate flights!?! I noticed that too !!! Or John T just wants to hang out with slim chicks !! Jus like shippin ya luggage! Can’t wait to book a tour. Also saw that they were offering pilot lessons: sign me up! ” Blue Sky Flights is now up and running, providing visitors the opportunity to see sensational views of the entire country from above” I am all for visitors contributing to our economy but seriously what happens to the people that live here, are we not worthy of a Bly Sky Flight. Goes to show they have no interest in the people of this country. Sad…. you make absolutely no sense….Where does it say “for visitors only”? Read what you wrote and show us and the world where it says “people that live here” are not worthy. Offering these excursions to visitors is great! It’s the visitors that bring foreign monies to Bermuda, helping us,(all) get out of the rut we are,(all) faced with…By the way, it’s not exclusive. No !! Your sad ! Saw this plane flying about a week ago, very very quiet, you hardly could hear it. There won’t be any issues with noise complaints. Need to book a flight on this. would like to know if there are any regulations that they must follow. i.e. flying to low, excessive noise, time restrictions, no closeup photos of private residences, flying over populated areas? Go to the Bermuda Dept. of Civil Aviation website. Look up the ANO-OTAR Regulations, It`s all there to educate yourself. Why is this stupid thing allowed to fly so low and round and round, it’s a noise nuisance and I remember the helicopter that used to buzz around always had the transponder turned off so no one knew how low they were flying, and yes beware of drones at that height! Ideal for spotting whales for whale watchers and spotting for rescue. Good to see this venture take off! As long as the police don’t hire this in the off season to start looking for fields of green…..
Oh wouldn’t it be nice if it was on floats! Then gotta deal with marine and ports uggg!! !